some tips to make the most of your new Taiwan dollars, the official currency of Taiwan, when you're scrolling through the island. Connect your laptop, mobile phone or tablet's network without cost that Taiwan offers foreign visitors. Your first purchase upon arrival. This smart card is used for public transport, stores 24 hours Family Mart or 7/11 or to pay in some tourist attractions like Taipei Zoo. Its use can save enough money for the trip. Use the bike rental system Youbike to get around Taipei. If you decide to travel long distances the best option is to rent a bike in one of the stores Giant stops around the island, an unforgettable experience. Download the mobile APP Pleco, the best application to translate the Chinese characters for, and try to memorize some basic expressions as 多少 錢 (Duōshǎo qián;? How much?)?. If you drive a little Mandarin will be easier to get better prices at the night markets, hotels and other establishments. Travel to Taiwan with the new route passing through Dubai Emirates (very low prices) or with airlines from mainland China; which they pass through Beijing (as Air China) and Guangzhou (China Southern Airlines as) are the most competitive. Off-season travel is extremely convenient in Taiwan, as prices come down quite considerably. Of course it is trying to avoid large domestic tourism dates, such as Chinese New Year or public holidays; during that time everything is more expensive. Some campsites Taiwan are free or have ridiculous prices. Also they offer hotels own services. On the east coast, for example, we found the campsites Ruishui, Shihtiping or Xiaoyeliu, where you can spend the night for a very affordable price and with all the amenities. Camping in Taiwan is the best resource on the network to find the best place to camp around the island. ... Do not forget your passport at home. Many tourist attractions on the island have student discounts. The capital of Taiwan is the place with the highest prices on the island. 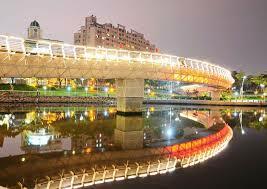 Visit cities such as Tainan, Hsinchu and Kaohsiung is much cheaper. It's easy to get discounts up to fifty percent in hotels the same day that you are going to install them. Persists and speaks broken some Chinese in negotiations, will help increase, more if possible, the discount. Taiwanese tend to eat almost always away from home, hence the street food is very cheap. Try to sample the culinary delights of the island at night markets and street stalls; very low prices for exquisite dishes. The Chiang Kai-shek Memorial Hall, the views from the elephant mountain or stroll through the night markets are just some examples of interesting tourist attractions you will not have to spend money to enter. The tourism industry in Taiwan is relatively young. If you escape to rural areas you can better understand the country's culture and, almost certainly, local try to make you feel at home, inviting you to tea, the typical food of the area or relax in the shade for a while . 15 Sleeping in schools or police stations! This happens especially in rural areas. If you do not find accommodation you can seek help from the police and will try to help you find something. If nothing is available you may be invited to spend the night at the police station or in a nearby public school. Although the number of bad luck for the Chinese, we must recognize that for travel by Taiwanese island 4 is the perfect figure. The four rooms are cheaper, the taxi comes cheaper and easier to get lower when trips or other activities prices. If you have purchased computers, mobile phones or any other electronic device, you're taking a joy when you return home: if you return the relcamas- five percent of your purchases in Taiwan. Taiwan Tourism Bureau, which is responsible for promoting tourism in the island, usually has some kind of promotion that will allow you to save some money and get some gifts. Check out the website before traveling. The magic word to save for food biandang (便當): a set that typically includes white rice with vegetables, meat or fish. There are thousands of locations around the island to buy this type of lunch box, which costs just over a euro. The best way to get the best exchange rate is currently change your Euros in any branch of the Bank of Taiwan, once on arrival.